C) From line slalom through poles dynamics on return (leg swings, kareokes, open/close gate, walking lunges, heel flicks, skips etc). Increasing intensity. Break up dynamics with partner dynamics (sideways leg swings, forwards leg swings, knee drives) (4 mins). D) Forward from line, diagonally backwards then burst forwards. Four in each direction (3 mins). 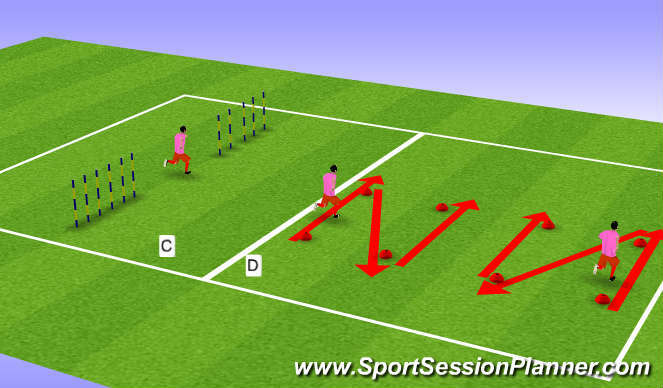 E) Reaction sprints. On line, reacting to commands of left, right or turn. Advance using opposites (2 mins).